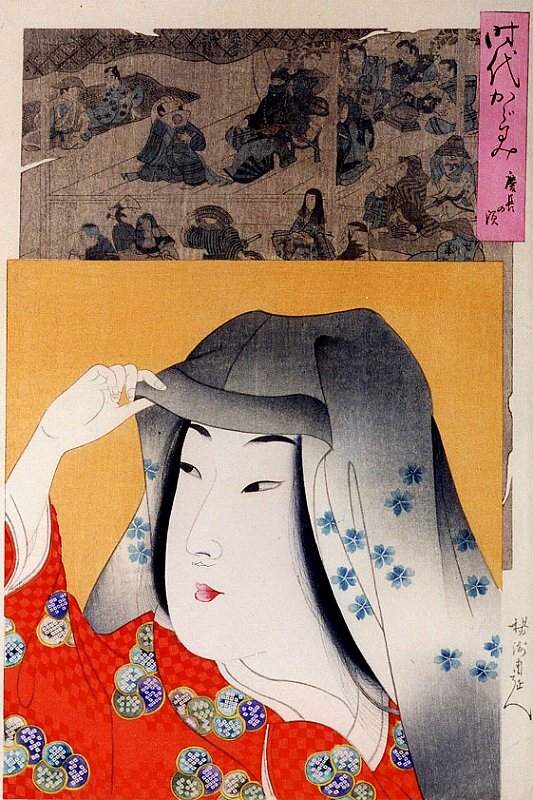 Bust portrait of a young bijin wearing a head-scarf decorated with a flower pattern. Above her in a cartouche actors in a performance on a stage. Ex Robert O Muller collection. There are 53 different designs in this series. If you look carefully you will notice that the edges of this image appear to be distressed by paper loses. This is a design decision similar to Yoshitoshi's ghost series where the paper was meant to look old and tattered. 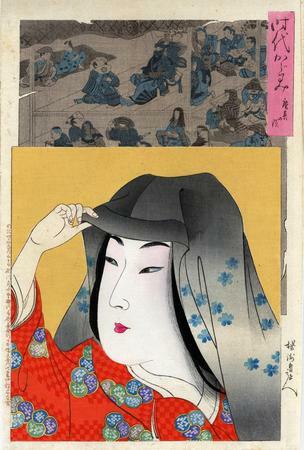 There are other copies of this print at Colorado College and in the Oita Prefectural Museum (大分県立美術館). There is a difference in the texts written along the left border of the print in the collection of the Tokyo Metropolitan Library and the one in the Lyon Collection. The Tokyo example clearly shows the date as Meiji 29, 4th month, while the one here is a bit unclear and looks like Meiji 29, 5th month. Outside of that, even the placement of these texts differ slightly. 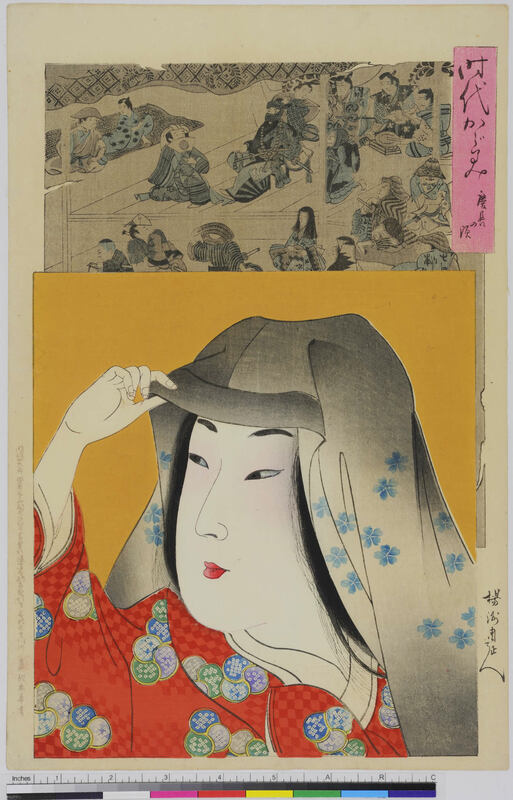 The Lyon Collection has theirs abutting the left side of the image and the Tokyo example is printed further to the left along the edge of the sheet. However, the print in the collection of the Freer-Sackler Galleries in place somewhere in between the two mentioned above. The Keichō period (慶長) dates from 1596-1615 must have been a very exciting time to live through. The name change from the previous era was due to a number of natural disasters during the short Bunroku (文禄) period. The Japanese had already invaded Korea in 1592 and there was a lull in the conflict in 1596 as the Japanese were preparing for a full-on second assault. In 1598 Hideyoshi died at Fushimi Castle at the age of 63. In 1600 the Tokugawa clan won their decisive victory at the Battle of Sekigahara. In 1603 Tokugawa Ieyasu was installed as shōgun. Ieyasu retired as shōgun in 1605 and was replaced by his son Hidetada. That was the same year that the first full of map of Japan was ordered, but it wasn't finished until 1638. In 1606 construction began on Edo Castle. In 1609 the Dutch East Indies Company was given permission to trade in Japan. In 1613 Hasekura Tsunenaga led a Japanese delegation to the Vatican. They visited several cities in Europe and even visited Spanish Mexico, sailing from Acapulco to Manila and on to Japan in 1619.